The Port Arthur Restaurant was established in 1897 and operated on New York’s Mott Street for more than 85 years. Chu Gam Fai, the original owner, selected the name obviously after what is now Lushun and would have been a much more familiar name back then. The restaurant was located on the second and third floors of 7-9 Mott Street. The entrance was an awning ornate pagoda-style and the Chinese pagoda-style balcony would eventually become a desirable location to watch the bustle of the Lower East Side from. 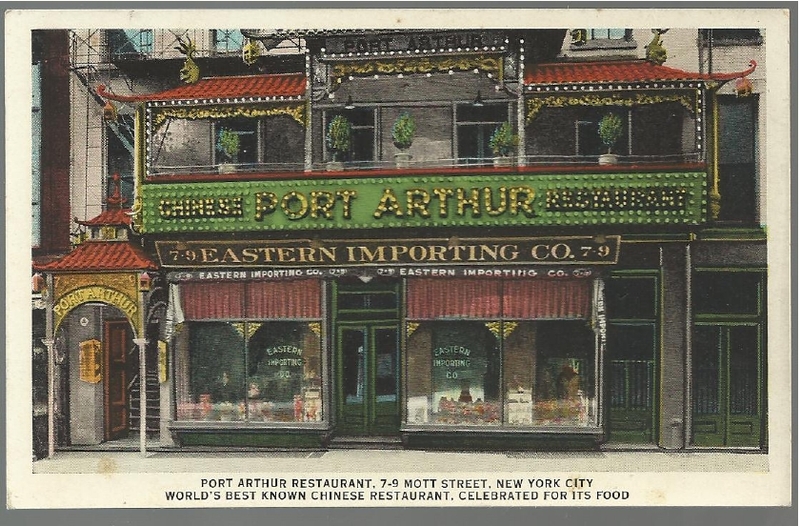 The Port Arthur was the first Chinese restaurant in NYC’s Chinatown to obtain a liquor license with the upper floor dining rooms reserved for private parties and banquets, – mostly used by local Chinese for weddings and family ceremonial dinners. The lower floor was for smaller groups of customers or after hour slummers wanting a little Chinatown chic. The furnishings were inlaid pearl mahogany tables, teakwood chairs, ornate wood carved panels, windscreens, lanterns, chandeliers and a baby grand piano. This was the first Chinese restaurant I ever went to in 1948 when I was 5 years old. My parents would take me here just about every week, for years and years – what a great place it was! I have a Postcard of the dinning area. Probably from the early 50’s. I was ther on our high school senior trip. I have a menu and matchbook from there. I like a high school that encourages you to collect matches!